Instead of using your eye to compose a photo on a camera or smartphone, what if your eye was the camera? Sony is looking into creating a contact lens that acts as a digital camera, according to a recent patent application filed by the company. The contact lens can capture still images or video using embedded sensors and camera components. To take a picture, all you have to do is blink. The device would be able to detect the difference between unconscious and conscious blinking, allowing a person to control the device by purposefully opening and shutting their eye. The unit would be powered by the movement of the eye, and even allow for advanced camera adjustments like aperture and shutter speed. After the images are captured, they can be transferred to an external device like a smartphone. Eyes have become a hot “next frontier” in technology. The failed Google Glass was just one of many stabs at face-mounted computers. Microsoft (MSFT, Tech30) and other companies are working on augmented reality headsets, which overlay computer imagery onto the real world. Other companies, such as Sony and Facebook’s (FB, Tech30) Oculus, are working on completely immersive virtual reality goggles. The eyeball, it seems, is the next logical step. 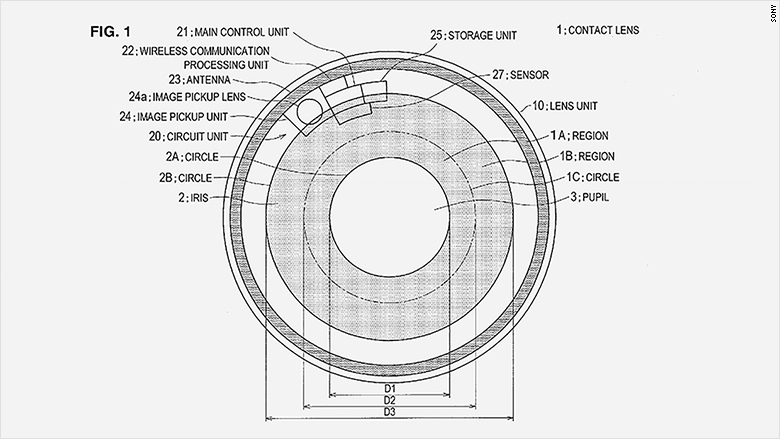 Samsung has also patented a blink-controlled contact lens that acts as a camera. That lens would act as an augmented reality device, overlaying images directly on the wearer’s eye. In 2014, Google announced it was working on a contact lens that could also measure a person’s blood sugar levels. In a different, more recent patent application, Google proposed a minor eye surgery that would implant an electronic lens into a human eye, primarily to correct vision problems. These are all just patent applications and don’t mean you’ll be able to pick up a new DSLR-eye at Best Buy anytime soon. The black and white line drawings of fantastical future technology are a common bit of business for these companies, and on the off chance the ideas do become real technology, it could still many years away. That will give everyone time to consider the privacy implications of being recorded by invisible cameras, or the difficulties of taking a selfie when the camera is stuck in your body.